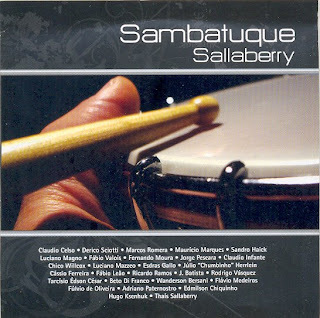 Jazz Station - Arnaldo DeSouteiro's Blog (Jazz, Bossa & Beyond): CD of the Day - "Sallaberry: Sambatuque"
CD of the Day - "Sallaberry: Sambatuque"
One of Brazil's top drummers in the current scene, Sallaberry releases his second solo effort. He wrote or co-wrote (with partners like Mauricio Marques, Luciano Magno, Fabio Valois, Jorge Pescara, Marcos Romera, Julio Herrlein, Luciano Mazzeo, Sandro Haick, Wanderson Bersani, Fabio Leão, Claudio Celso and Tarcisio Edson Cesar) all the 13 songs in the program. All of the above mentioned musicians also perform on "Sambatuque", along with bassists Chico Willcox and Adriano Paternostro, guitarists Fulvio de Oliveira and Beto Di Franco, saxophonist Derico Sciotti and many others. Guitarist Claudio Celso, whom I first heard 25 years ago when he recorded on Claudio Roditi's debut album for CTI ("Red on Red"), shines on his own "Surprise". Electric bass wizard Jorge Pescara uses his Megatar Toneweaver Bass on "Caliente". Claudio Infante plays tabla & kartalas on another Eastern-influenced tune, "Namaskar". Other favorite tracks: "Cumbica" (delightful bossa), "Outono", the frenetic "La Luna" (including the horn section comprised by Esdras Gallo, Edmilson Chiquinho & Hugo Ksenhuk), "Bela", "Frevo Amigo" (Cassio Ferreira on soprano sax) and "Balacobaco". Sallaberry endorses Zildjian cymbals, Evans drumheads, C. Ibañez sticks, Power Click in ear monitor, Urban Boards drummer shoes, and Free Hand percussion. CD of the Day - "Léa Freire: Cartas Brasileiras"
CD of the Day - "Karyme Hass: Amor Solene"
Obama: "My address to Congress"
CD of the Day - "Alaide Costa: Coração"
Introduce Your Kids to Jazz with WeBop! DVD of the Day - "Happy Mondays: Call The Cops"
CD of the Day - "Sabrina Malheiros: New Morning"
CD of the Day - "Sabrina Malheiros: Vibrasons"
EP of the Day - "Sabrina Malheiros: Maracatueira"
Miles Stiebel free download - "Midnight Fifty"
CD of the Day - "Sabrina Malheiros: Equilibria"
Single of the Day - "Azimuth: Grupo Seleção"
CD of the Day - "Gerry Niewood: Share My Dream"
DVD of the Day - "Larry Coryell: A Retrospective"
EP of the Day - "Sabrina Malheiros: Iemanjá"
Bonus tracks on Diana Krall's "Quiet Nights"
CD of the Day - "Daniel Smith: Blue Bassoon"
CD of the Day - "Soft Machine: Drop"
Tributes to "The Sound of Philadelphia"
"We Are The Jazz at Lincoln Center Orchestra"
Box Set of the Day - "Divas"
Alla Cohen in "Bay Windows"
Steve & Eydie - "Happy Valentine's Day"
EP of the Day - "Lalo Schifron: Jaws Remix"
EP of the Day - "Grover Washington, Jr."
CD of the Day - "Hank Crawford's Back"
Cassette of the Day - "Hank Crawford: Tico Rico"